The strips that make up the lattice grid are joined with half-lap joints—more than 300 in total. Position the dadoes with a simple indexing jig (see page 134). Mount a 3/4-inch-wide dado head on your table saw and adjust the blade height to half the width of the stock. 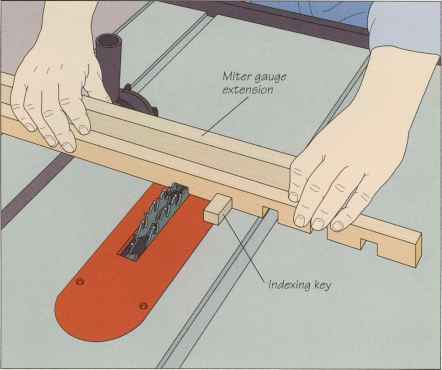 Fix the jig to a miter gauge extension to leave VA inch space between dadoes. Start with stock one inch longer then the nominal lengths given in the cutting list. To cut the first dado in each piece hold it on edge against the miter gauge with one end butted against the key. Make a pass through the cutters, then move the board along the gauge, fitting the new dado over the key, and make another pass. 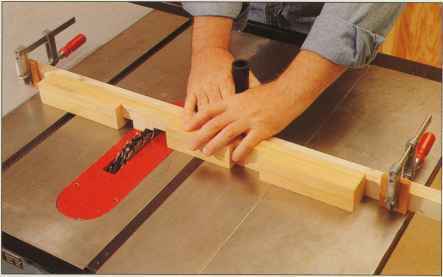 Continue in this manner until you have cut dadoes in all the short and long strips.